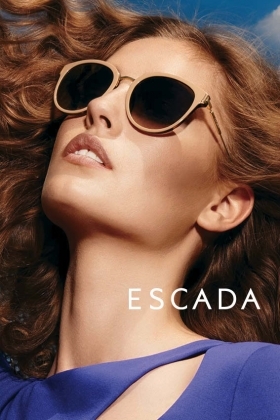 The ESCADA Eyewear collection 2015 takes inspiration from the Brand DNA and its fashion codes. Modern elegance, cool glamour and distinctive details are the main characteristics of the collection reinterpreted in a big variety of styles created for an elegant woman always up to date with the latest fashion trends. Fashion and feminine eye shapes like cat eye and butterfly with precious materials and finishing are sophisticated and contemporary whilst trendy eye shapes, rounded and 80’s styles with daring colors, flower or leo prints are designed for a trendy and urban styling. Everything in the collection reveals extreme refinement and attention to distinctive details for a feminine and contemporary woman. Ceramic inserts, crystal decorations and metal chains worked with sophisticated microfusion process make each style even more distinctive. The double E logo is the special signature of the collection and is reinterpreted in different ways: casted on metal temples, embellished with crystals stones or engraved on the gold temple tips. Colors: In addition to the black and Havana colors, the collection features new, vibrant hues such as pink, red, green and blue. The frames, made of acetate or metal, create an effortless elegance yet casual aesthetic. SES346 col. 748 – Metal details for a chic and feminine look. The acetate cat eye front is embellished with a metal bar enhancing the wearer’s eyes. The lenses are smoke gradient. Available in full havana and black and also in a refined combination of colorful yet very refined combinations: black/shimmering crystal, coral/shimmering pink, beige/shimmering orange. SES347 col. U62 – Oversized model with a rounded acetate front that contrasts with the thin metal bridge and the temples. The ESCADA E logo is engraved on the gold temple tip. Available in unique and refined acetate textures: beige/havana, blue/ havana, bordeaux/havana, black/havana and black. SES348 col. ALF – An 80’s inspired acetate model. The inner part of the chunky frame is personalized with a cool touch of a leo print. Available in a wide range of color combinations: black with brown/white leo print, beige with black/white leo print, havana/light brown, red havana/fuchsia, green havana/beige. SES349 col. AP3 – Ironic and fun, this acetate model is perfect for the summer. The rounded front piece is presented in a colored floral pattern. Available with black, white and red temples.